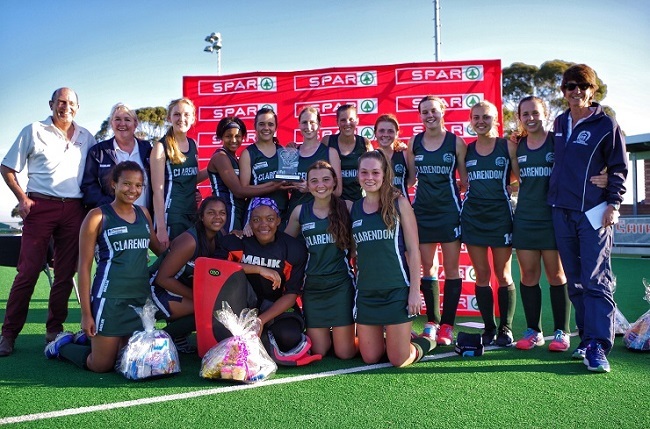 Clarendon High defeated Stirling 2-0 in the decider of the Border Coastal event to book their berth in the SPAR Eastern Cape Schoolgirls Hockey Challenge provincial finals in East London on Sunday. The new champions had lost to Stirling in the pool phase of the tournament, but came back strongly to produce their best performance of the day in the final. The results means Clarendon will take part in the provincial finals at Woodridge, just outside Port Elizabeth, on August 12. They have joined Union High, who won the Port Elizabeth Inland tournament, and Kingsridge, who were crowned Border Inland champions last Sunday, in the provincial play-offs. Last year’s champions, Hudson Park, were eliminated by Clarendon 3-0 in the semifinals, while Stirling beat hosts Cambridge 2-0 in the other play-off. Tournament director Bev Forword said it was another excellent day of exciting schoolgirls’ hockey. “The final between Clarendon and Stirling was always set to be a humdinger after their closely contested pool match,” said Forword. Spar Eastern Cape promotions and advertising manager Alan Stapleton said there had been plenty of quality on display during the day. “It was great to see all the teams enjoying the fun aspect of the day, but also showing their competitiveness on the field of play,” he said. The final two teams for the provincial finals will be decided over the next two weeks when the South Western Districts tournament takes place in George on Saturday and the PE Coastal competition is held at Pearson on June 4.